Parking meters are animals-turned-regulatory devices now enslaved and used by the government to put a little extra cash in their pockets while the everyday person gets a place to put their vehicle of choice. They are very useful little things, except when they are "out of order" (a horribly contagious disease contracted by meters and other similar species, but strangely having no effect upon humans), as a large percentage of them are. It is believed that they may someday reach extinction as a result of this sickness unless humans can continue to cure them one by one. 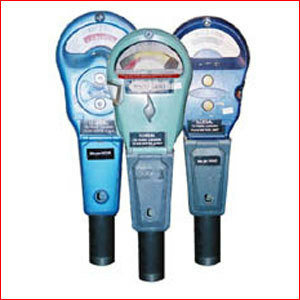 Parking meters tend to inhabit the concrete jungles of America, taking root along roadsides in designated parking areas. They are not accepted by zoos for some reason as exhibits. Parking meters are lazy and wait for people to come by and feed them their favorite food, coins of varying size and value. The more that is inserted, the longer before the parking meter is hungry again. When a meter is hungry, a smal tongue reading "TIME EXPIRED" will pop up, reaching for food somewhere. Policemen will mark and eventually remove cars that are parked next to "TIME EXPIRED" meters because it is considered abuse of the animal to leave a car in front of it and not feed it. Poor things. Single head - "Normal" meters. Double head - The tragic result of radiation poisoning. People feed both heads and park two cars next to these as a way of making them feel better about their abnormal anatomy. There are also sub-varieties that have adapted depending on the city where they live, but there are too many of these to list and they continually change their colors, shapes, and sizes as they constantly adapt to the surrounding environment. This page was last edited on 28 October 2015, at 21:25.